Huge bang for your buck. 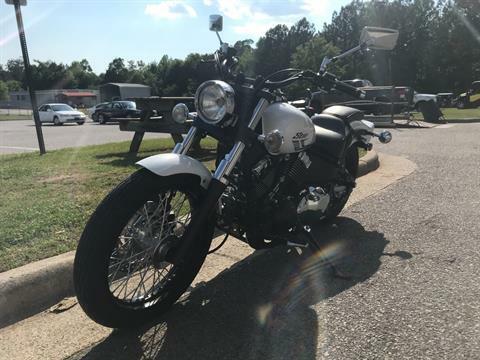 Beautiful, old school hot rod styling, lightweight, easy handling. 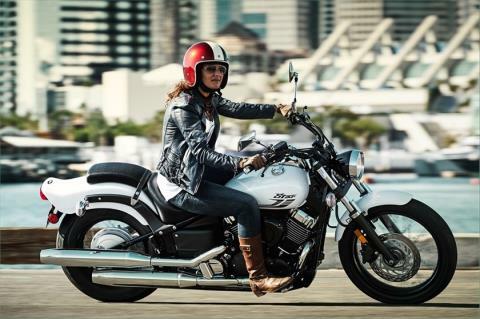 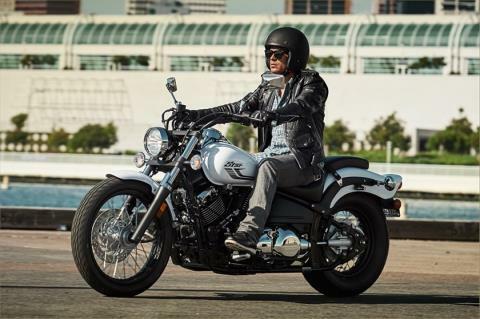 LIGHT AND NIMBLE CHASSIS: The V Star Custom is the lightest of the full-size Stars, which means great handling and performance are along for the ride, too. 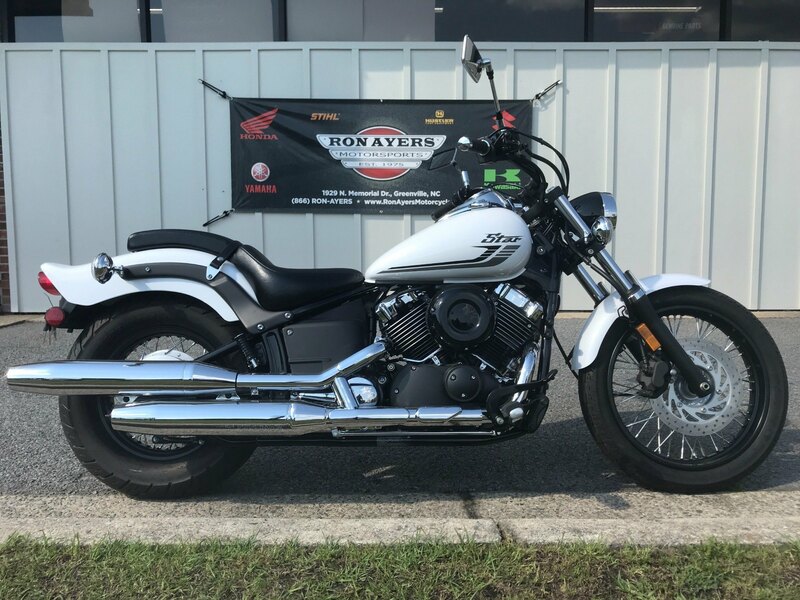 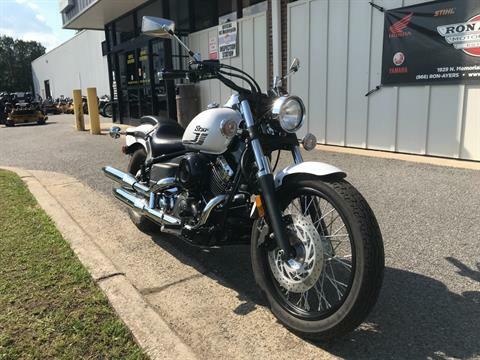 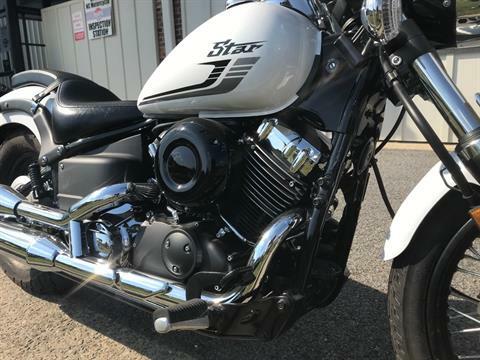 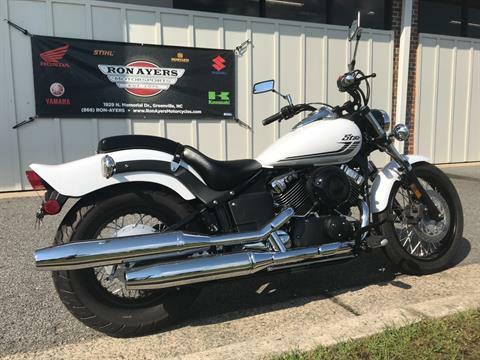 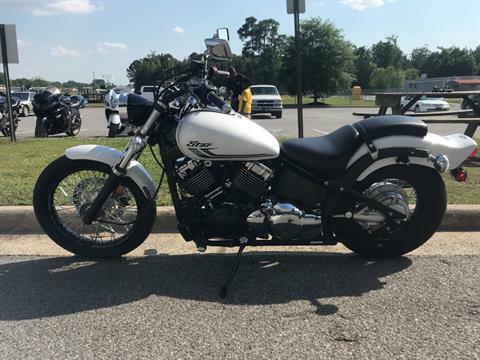 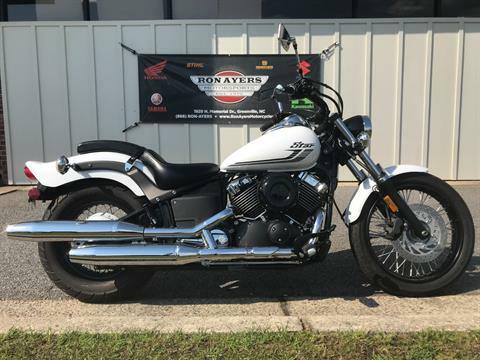 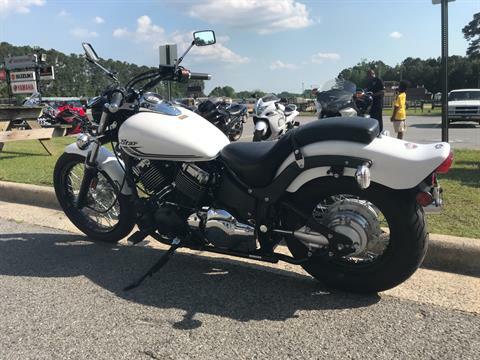 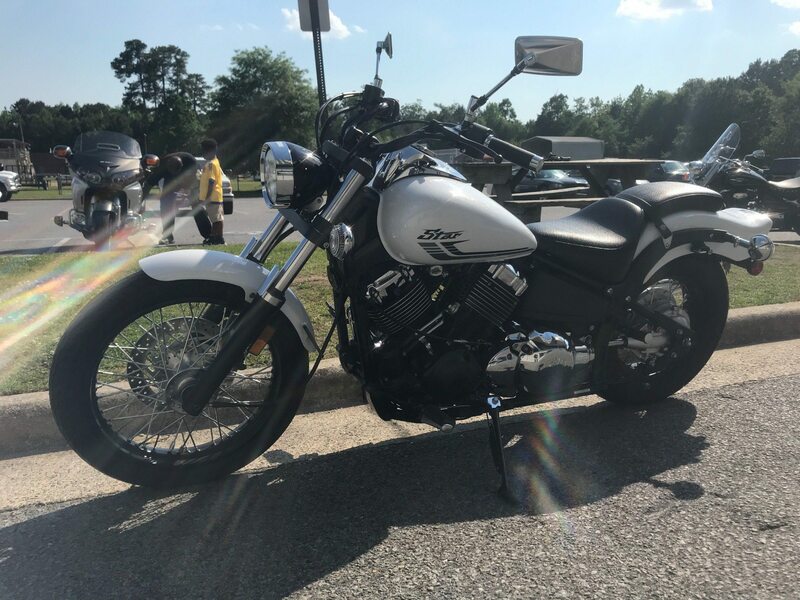 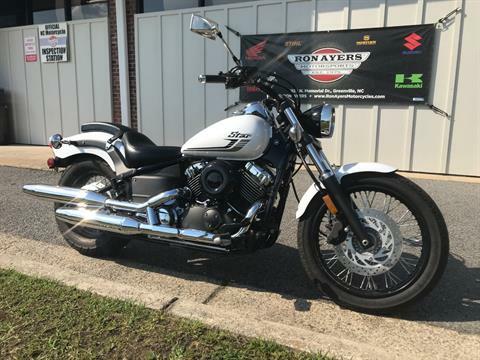 STYLE PLUS VALUE: Dual exhausts, custom-looking clear turn signals, lots of chrome—the V Star Custom represents tremendous cruiser bang for the buck. PLUSH RIDE QUALITY: Classic rigid-look rear end serves up 3.4 inches of rear wheel travel damped by a hidden preload-adjustable shock, offering up a great ride. LOW SEAT HEIGHT: 27.4-inch seat height lets riders get both feet on the pavement. FUEL EFFICIENT ENGINE: Estimated 49 mpg means over 200 miles of riding before fill-ups. 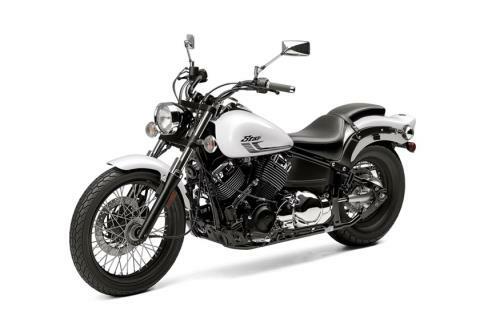 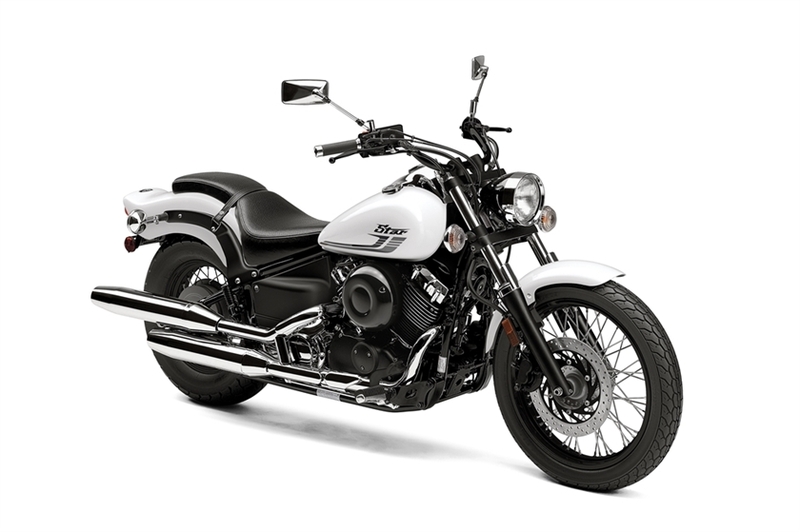 STYLISH, TORQUE-RICH MOTOR: Beautifully chromed and polished 40-cubic-inch (649cc) air-cooled, SOHC 70-degree V-twin cranks out torquey low and mid-range power with minimal engine rpm—maximum torque is reached at only 3000 rpm—for powerful, smooth cruising performance. 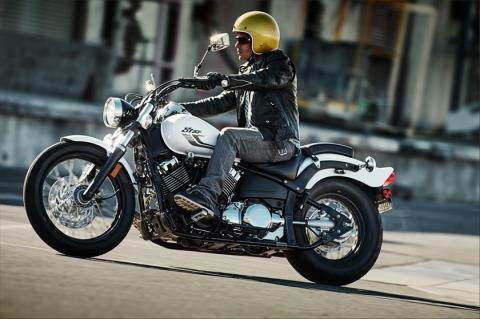 HIGH-TECH CYLINDERS: Forged, lightweight pistons run in a plated ceramic-composite cylinder-bore. 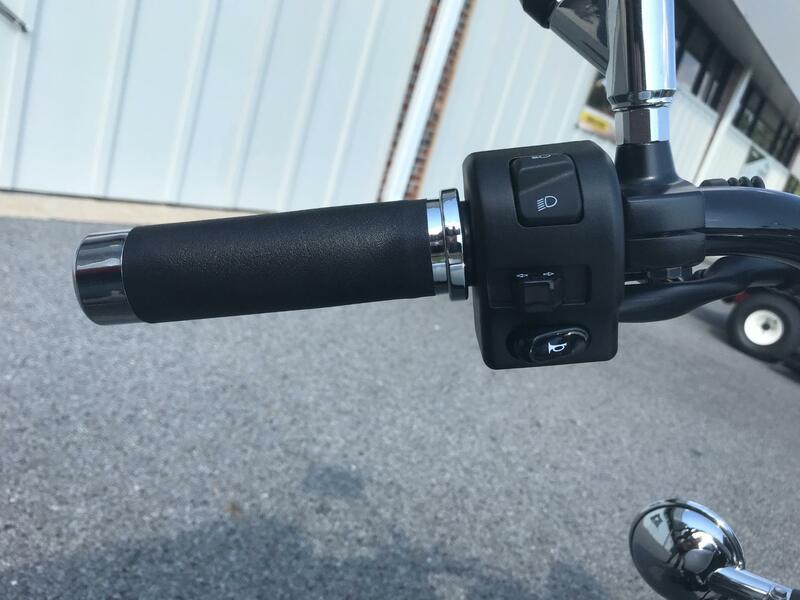 This advanced design ensures superior heat dissipation, greater durability and reduced vibration. 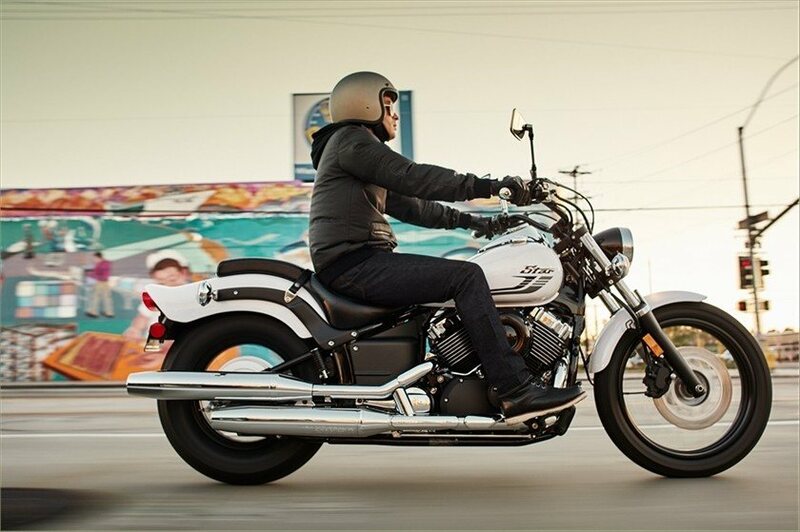 SEALED SHAFT DRIVE: The V-Star’s efficient and quiet shaft drive requires almost no maintenance. 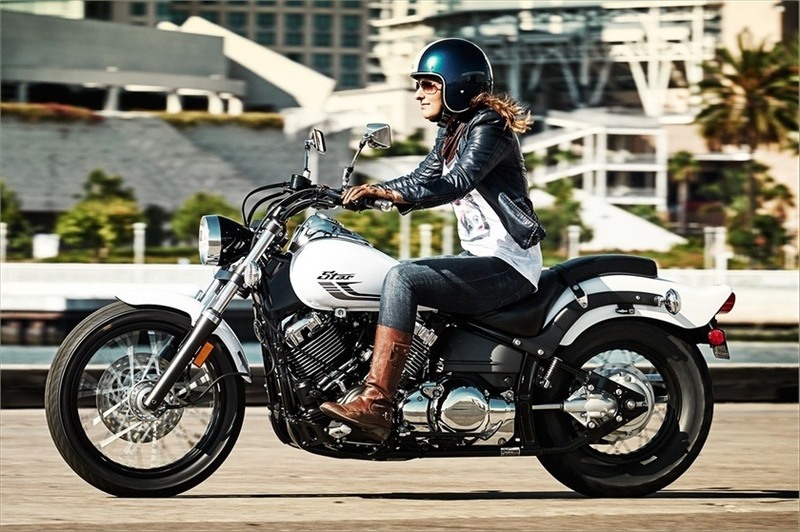 ADVANCED FUELING: Dual heated Mikuni® 28mm carburetors with a throttle position sensor (TPS) features a progressive pulley, electronic fuel pump and handy side-mounted air filter. 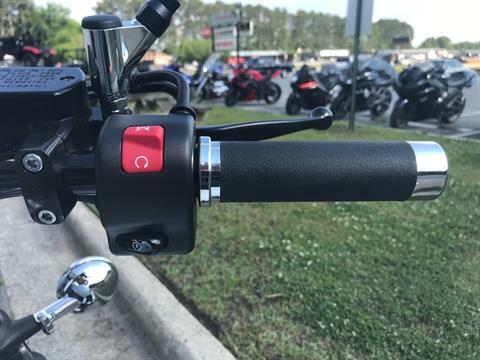 This system provides a consistent fuel flow, great throttle response and optimum power throughout the rev-range. 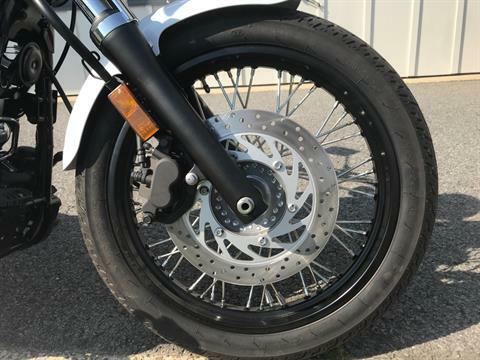 BROAD, FLEXIBLE GEARING: Wide-ratio five-speed transmission ensures extremely usable, cruiser-friendly power delivery to the asphalt. SLEEK PAIRED EXHAUSTS: Two-into-two chrome exhaust pipes create sleek styling and deliver maximum low- and mid-range engine output. ROBUST STEEL FRAME: Stout, large-diameter steel frame is designed to provide low seat height with ample rider legroom. 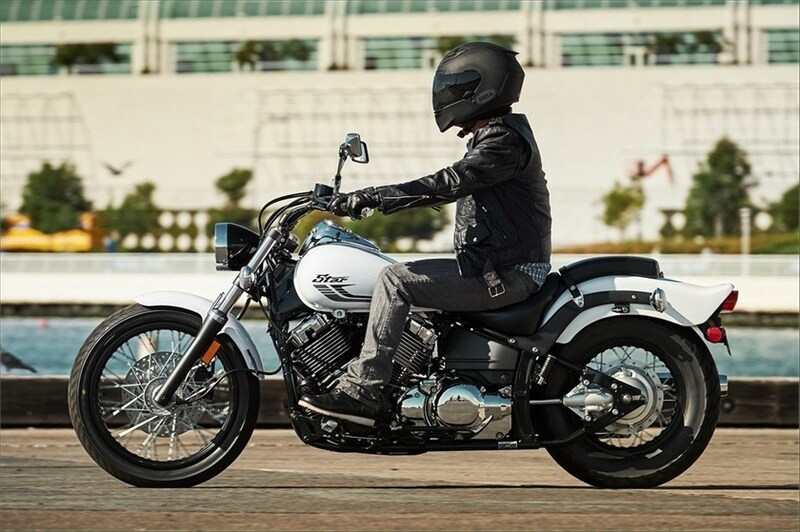 BOBBED STYLISH TOUCHES: The bobbed fender evokes a look that’s both sporty and stylish. 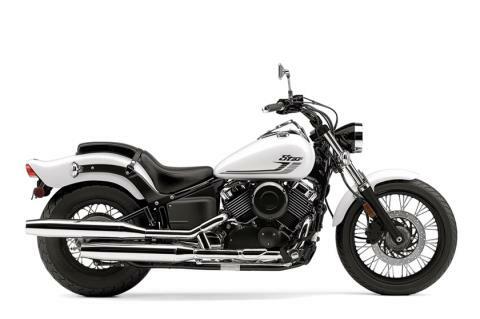 STABLE AND STYLISH GEOMETRY: Extra-long, 63.4-inch wheelbase adds to rider comfort, handling, and creates a long and low retro look. 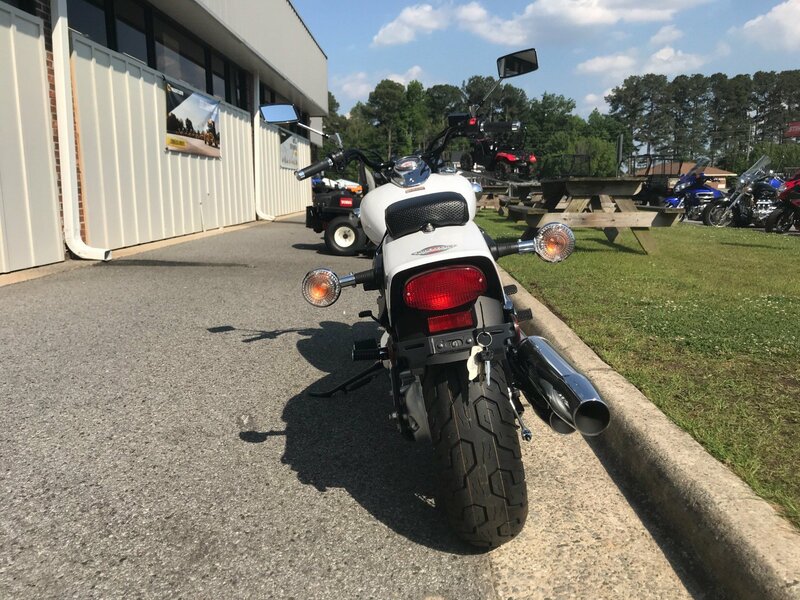 LOW SEAT HEIGHT: Large, low-profile seat provides exceptional rider comfort while low, 27.4-inch seat height allows the rider to easily put their feet down on the pavement for extra confidence at stoplights. PLUSH SUSPENSION: 41mm aluminum telescopic front fork with 5.5 inches of travel and tube protectors ensures a smooth ride with stylishly sporty durability. 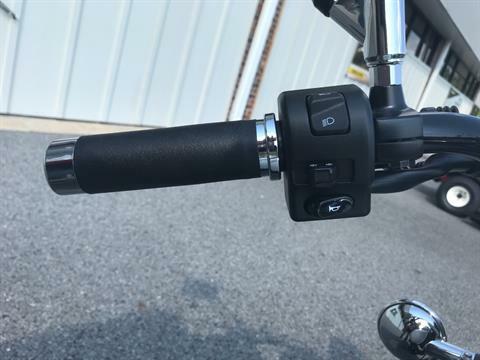 Link-type, preload-adjustable single rear shock with 3.4 inches of travel provides excellent handling and plusher ride quality. 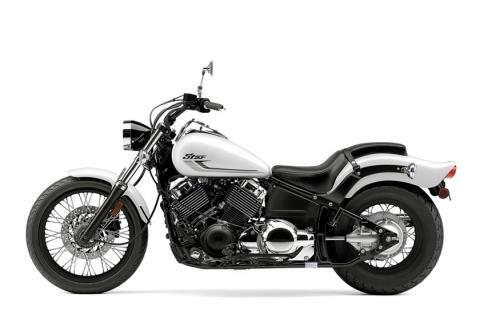 HIDDEN SHOCK DESIGN: Rear shock is tucked out of sight under sporty bobtail fender for that classic, hardtail look. RELIABLE STOPPING POWER: Single hydraulic front disc and rear drum brakes deliver strong, confidence-inspiring braking power and feel. 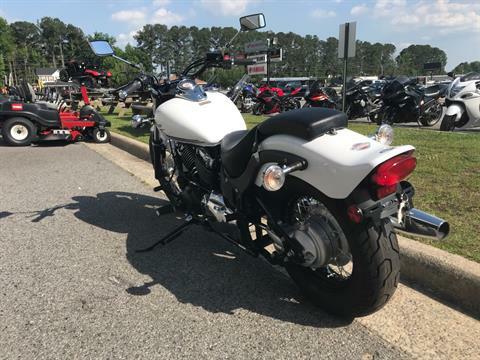 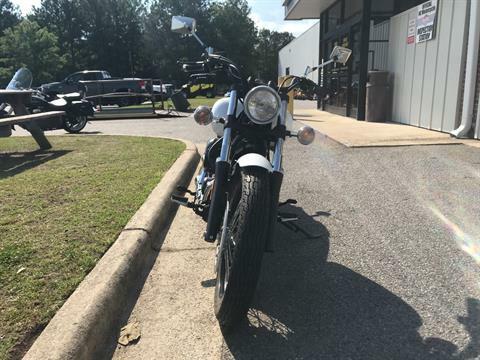 CUSTOM WHEEL AND TIRE PACKAGE: Narrow front tire on wire-spoked wheel completes the V-Star Custom’s design and delivers quick steering for sporty handling. 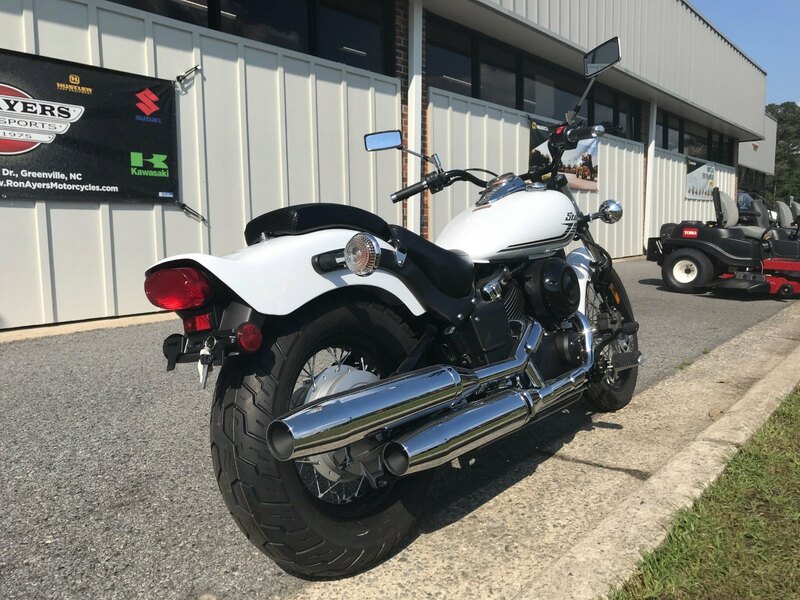 BUILT TO TURN HEADS: Industry-leading Star family fit and finish features rich, lustrous paint and extensive chrome accents that create a stunningly timeless machine. 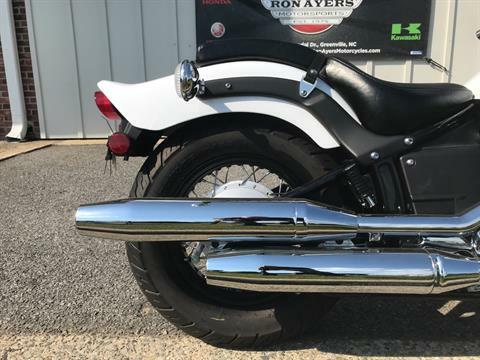 READY TO TRAVEL: Large, 4.2-gallon teardrop fuel tank features class-leading fuel capacity for extra-long-distance cruising range. 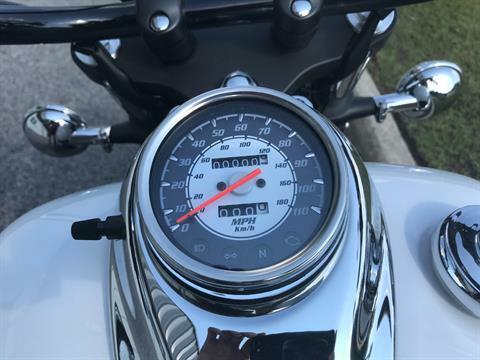 TANK-MOUNTED INSTRUMENTS: Beautiful, tank-mounted speedometer is designed with a large face for easy reading of tripmeter displays and turn signal, neutral, high beam, and engine diagnostic indicator lights. 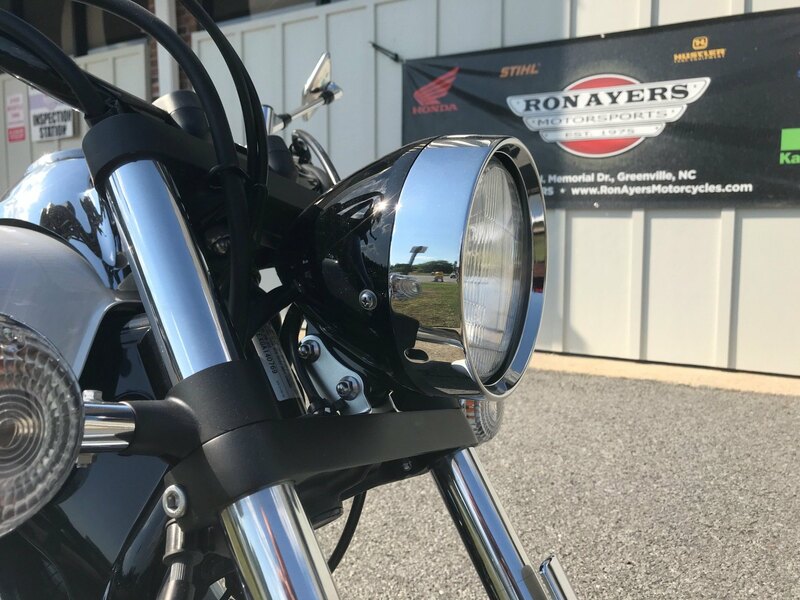 BRIGHT HEADLIGHT: Chrome, bullet-style 60/55-watt halogen headlight adds a nice, stylish touch and maximizes nighttime visibility. 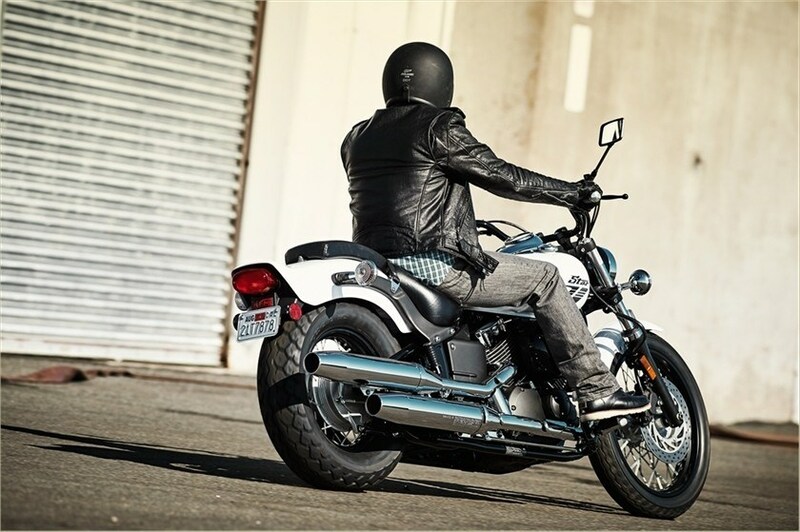 MODERN BATTERY: Maintenance-free 12V 10AH battery ensures reliable, no-fuss starting. STANDARD CONVENIENCE: Under seat helmet holder increases convenience for the rider, as does a locking compartment under side cover for secure storage for small items.